There are some characters that seem over-represented in toys and statues compared to their significance in the comic book world. One of these is the Black Cat. As well as a number of action figure releases, she’s also had the royal Sideshow treatment - statue, 1:2 scale bust and Premium Format Figure, and she was chosen as the character for Gentle Giant’s first Mini-Bust for their Marvel licence. Perhaps it’s just because I’m not a Spider-Man reader, but she really hasn’t featured much in comic book reading over the years, so I’ve always surmised that her prevalence in the collectibles world must have something to do with looking halfway decent in a cat suit. 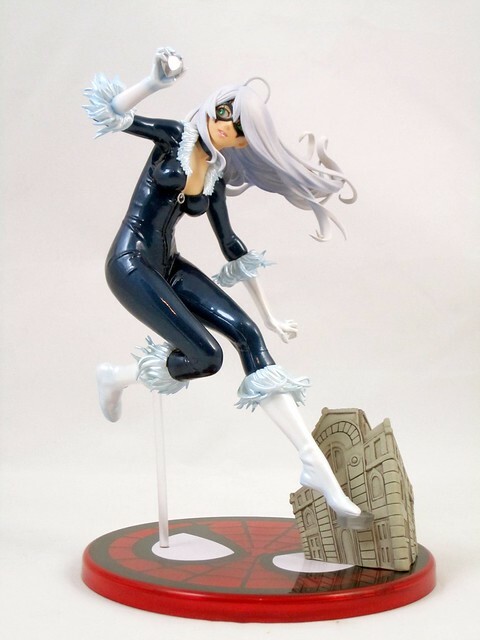 Tonight’s rendition of Felicia Hardy that is going under the review scope is the Kotobukiya Marvel Bishoujo Black Cat Statue, the latest in its highly successful line of PVC Superheroine Creations. I am very big fan of this line, and Black Cat is a nice addition to the series. However, there are a couple of issues that will prevent this statue from making it to the front of my Koto display. Using vinyl as a base for a piece like this provides the opportunity for a great deal of creativity, especially in terms of smaller pieces that would be difficult to sculpt in other mediums or be too susceptible to breakage. This works to good effect with things like the fur on Black Cat’s cuffs and boots and especially the flow of her hair. I really like the way that each lock of her hair seems individually crafted, although I could have done without the one lock that sticks of Alf-Alfa style at the top of her head. There’s also some pretty impressive detail in her uniform, with little fabric wrinkles and creases that make her movement look realistic and give the piece a sense of depth by really creating the look of a layer of fabric on skin. One very strong element of this statue is the paint. There are nice shadings within the white sections to give it depth, and the “black” in her costume is really a deep metallic-ish blue which adds a great deal to the piece. Her green eyes are very nicely painted, and there are no streaks or splodges about, keeping this line’s record of excellent paint jobs intact. There are two things that bring this piece down a couple of notches for me, and the first is the pose. I appreciate that Koto is trying to avoid a sense of same-ness in these pieces, but the attempt here at a dynamic pose just ends up looking awkward. The fact that the statue requires an extra support for the right leg (which is made of clear plastic but still looks silly) to hold it steady just means to me that the idea is too fiddly. When you compare this pose to the power of the Emma Frost statue or the coyness of the Scarlet Witch, this strange pose doesn’t measure up. The second is the base, which is the silliest of the Bishoujo line bases yet. As I have said before, the bases of these work best when they are incorporated into the design like Scarlet Witch’s cape or Phoenix’s flames. When this isn’t possible, understated is best, and this base is anything but. The original photos of this piece had the same miniature building which forms the stand for Black Cat in the final version, but the base itself was a smaller red circle. The final version has a larger red base with a Spider-Man symbol on it. This may have always been the plan, or may have eventuated when it was decided that the free leg needed a support. Either way, it makes this piece take up a fair bit of shelf space. The introduction of the colour red to this piece is a real clanger for me - Spidey or not. All up, there’s just a bit too much happening here to make this piece a real winner. 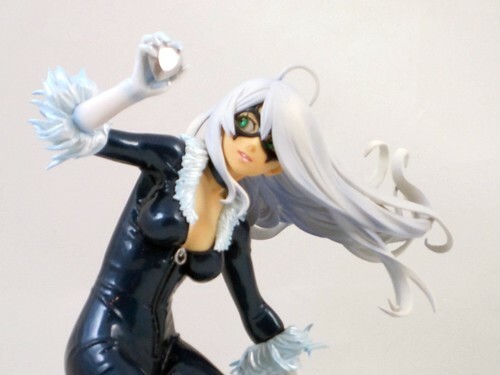 Despite these concerns, Black Cat is still a welcome addition to the Bishoujo line, albeit one that comes with some “what-could-have-beens”. She definitely belongs in the display, but due to the above niggles and her space-hogging circumference, she’s not going to make it to the front. Let’s hope Koto gets back to some more attractive poses and meaningful bases for this series, as it still has a great deal of life in it! I like it and am waiting for mine to ship (when the order it's with gets a little more complete). The base could have been better done with a Black Spider-Man Mask, but I don't really mind either way. I can put it up high so the base isn't an issue and that problem is solved. I bought the first "figure" in the series (Black Widow), but after I got the look from the wife I decided to skip subsequent releases! Great post! It’s very interesting and enjoyable. It’s must be helpful for us. Thanks for sharing your nice post. This post is probably where I got the most useful information for my research. This style is quite attractive and i completely appreciate it. Free Amazon Gift Cards Thanks for your post buddy! I really love it. Honestly i like second type and buy it but how it's possible. Anybody can you inform me? where i will get them. Thanks for sharing. Let me apply this for my industry. Nice blog, If you are looking for any kind editing in your photo then visit Clipping Path Service from there you can get your photo edited at affordable price. Precisely Its not about the posture. The picture has something wrong.among two I link the second one. The cap is invisible I cant see it.clipping path service is the work for specialist.